Queen's View is said to have been Queen Victoria's favourite view, hence the name. It is said that she always stopped here to admire the view on her way to and from Balmoral. 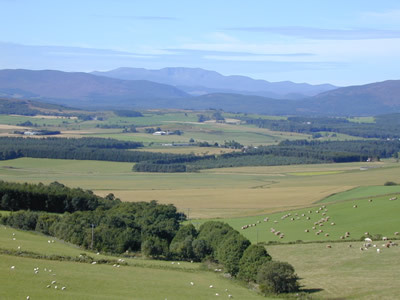 From the spot, you can see the whole of the Tarland bowl, including Lochs Kinnord and Davan and as far as Lochnagar. It is on the B9119 on the Aberdeen - Tarland road. There is now a planning application in the system that could destroy it. A Mr. Alex Sim, who now lives in Devon, wants to dig a quarry that will wreck the area. The scars would be visible for miles around. Impressions can be seen on the website referred to at the end of this article. A noisy, dusty quarry would be bad enough but there is also mention of a "recycling facility" or as we would say "rubbish dump". The effect on the environment in the area would be unquantifiable. The planning application was lodged at Stonehaven on 23/12/02 and objections closed on 28/1/03. The local councillor has held a public meeting and the MacRobert Trust have submitted a detailed objection. The application is outside the Local Plans which consider the area to have Local Landscape Significance. There are alternative sources of aggregate and thus many people expect that this application will be rejected. However, Mr Sim intends to appeal and is confident that he will eventually get permission. We need to make sure that this doesn't happen. Mr. Sim is no stranger to controversy. Indeed, he has featured in the Press and Journal as contesting enforcement action over a development in England. He denies that his company has breached planning regulations at a quarry it operates at Exeter and will be fighting allegations of improper conduct at a public enquiry next month. Apparently, 60,000 tonnes of material has been dumped at the quarry, breaching planning restrictions. He's a seasoned campaigner as he's just finished sorting out a previous enforcement order over a failure to reinstate an area of land at the quarry. He's clearly somebody who can be trusted to comply with planning regulations. Should we really sit back and let somebody destroy such a historic area? We urge concerned readers to make your views known in writing. 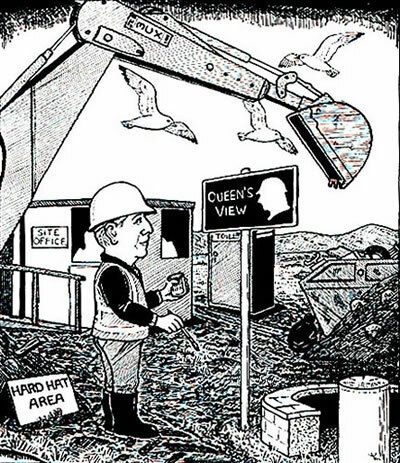 There is an excellent web site at savequeensview.co.uk which expands on this summary.